Wheel set If desired you can choose a wheel set with brakes (3 pieces) for this product. Product adjustment costs are included. Heavy and stable tripod carried driven by means of a hand winch. Suitable for mounting terrace screens, Heathers, air cooler's, lighting or as additional third hand for Various Interests. 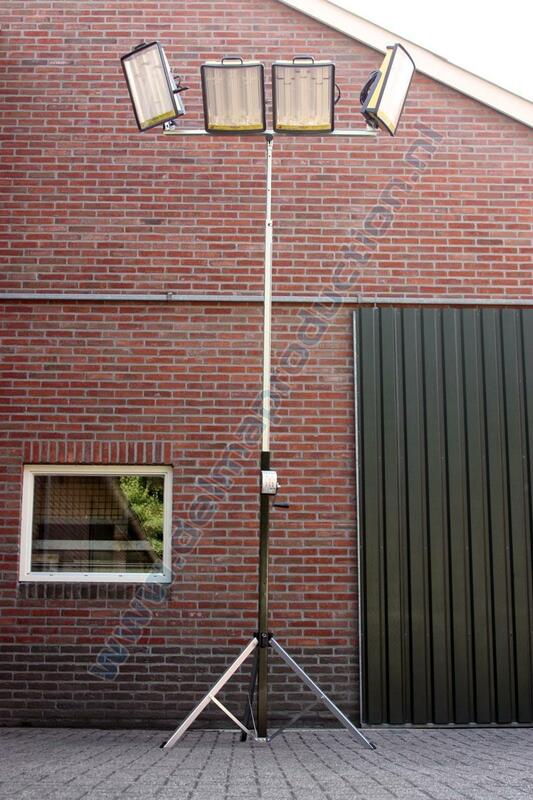 With a maximum height of 3.8 m and maximum load of 80 kg. The tripod can be used for multiple purposes. Please note! 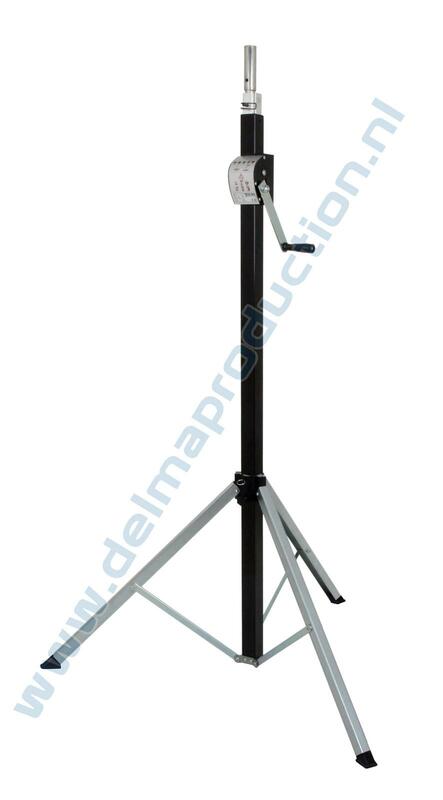 This tripod is not in accordance with EN 60598 and therefore not suitable as tripod stand for use on construction sites, but may be used as a tripod stand where no construction regulations apply. By means of a hand winch the lift is easy and light adjustable. It is foldable, making the storage and transport more conveniently. Black / Zinc plated finish. ML-001 Bracket with 4 isolated hand grips to move the tripod controlled, safe and ergonomic. With a attachment bracket, your vulnerable armature can be stored safe and compact. ML-010 Removable extended strip for connection of armatures with a hole distance of 60 up to 170 mm. and with M8 thread in the middle. ML-011 Removable extended mounting bar 1 m. length for connection up to 9 armature positions and with M8 thread in the middle. ML-012 Removable extended mounting bar 1,5 m. length for connection up to 13 armature positions and with M8 thread in the middle. ML-013 Removable cross mounting bar (0,6 x 0,6 m). For connection up to 9 armature positions and with M8 thread in the middle. Or to use as a plateau for air conditioning etc.